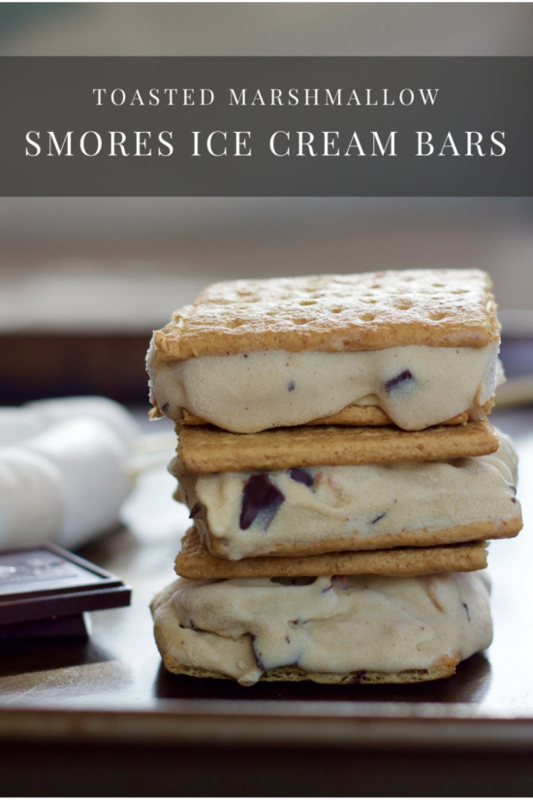 These Toasted Marshmallow S’mores Ice Cream Bars have all that campfire flavor and perfect for a hot summer night. Vegan and dairy free. Happy Friday!! Any fun plans for the weekend? I’ll be headed to my 10 year high school reunion on Saturday. That feels so crazy to say. It’s been 10 years since graduating high school, and 5 years since my college graduation and our wedding… which happened to be back to back weekends. Because that’s how we roll. It’s hard to believe that in just 4 short months we will be beginning another new chapter and growing our family from just the two of us and our furry child, Pearl to a family 4. Can I just say how happy I am that we are having a little boy too. I’m pumped to be joining the #boymom club. Let’s be real– girls are super cute and they have the best clothes, BUT… and that’s a big BUT. Girls are drama. I know this because I am one.. and I was little once and I have heard about all the drama I caused my parents. I know one day I will receive my payback, but I’m certainly glad that it’s not right now. Little boys are easy, right? No drama, okay good. Let’s just pretend that it’s true for now and I’ll give you an update when we cross that bridge. I’m praying our little guy is just like Eric–> a sound sleeper, super lovable, easy going, and too darn cute… curly hair and all. A girl can dream right? I keep my ice cream maker freezer bowl in the freezer all the time just for recipes like this one! So I don’t have to wait for it to freeze to make this. Can’t wait to try! Most commercial marshmallows contain gelatin — they are not vegan (not even vegetarian!) You may want to change the label on your recipe, and/or suggest using vegan marshmallows — Dandies is the brand I typically use. A creative idea, regardless! Sounds delicious. Aww hope you have a wonderful time this weekend reconnecting with old friends and going down memory lane! Gosh time sure flies, right? Haha my sister tells me every time that boys are sooo much better (she may be a bit biased). Drama? That was totally not me ;). Thank you Min!! I don’t wish moving the moving process on anyone. In the end you will be happier, it’s just so hard to go through. I hope you guys can make the most of it and have some fun despite the madness. Boys are less drama but they are ton of ACTION! It keeps life interesting. 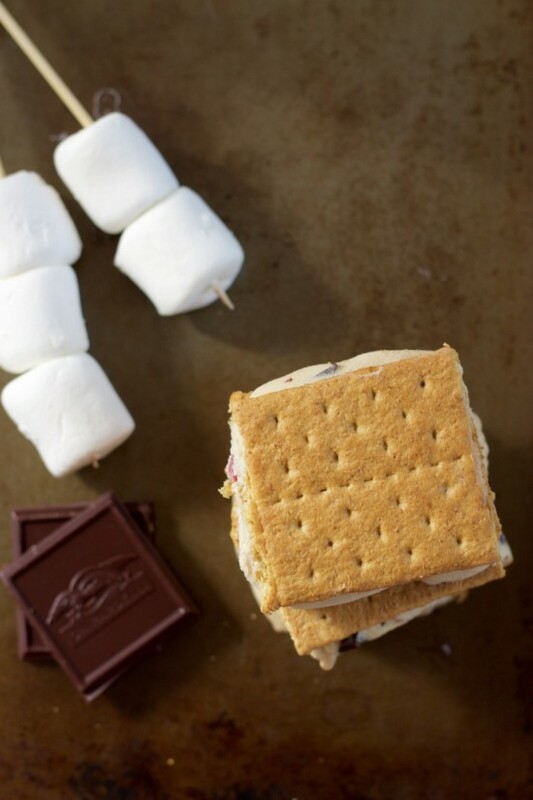 You are going to love it, just like this s’mores recipe. Yes— I felt this deep in my soul as soon as we found out we were having a boy. We were we’re having a girl all the way so that realization that we were having a boy made me feel like I had to get training and immediately went on a run. lol! 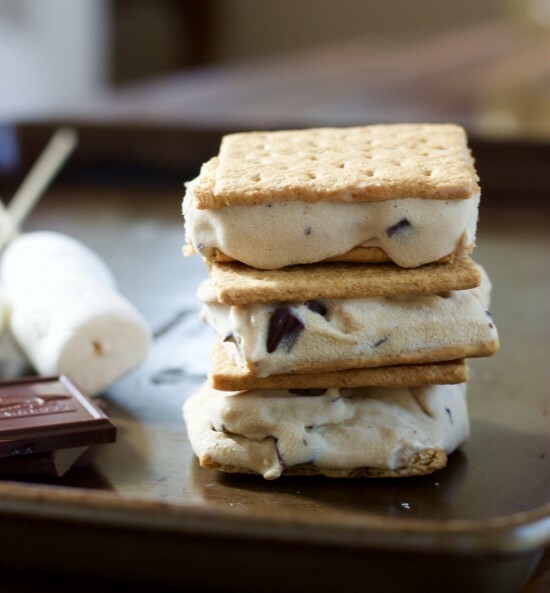 These ice cream sandwiches look a-ma-zing! I want one right now! As a mom of twin girls who are 3 going on 16, I can say you are spot on about the girl drama. I am just bracing myself for the teenage years! your girls are sooooo precious! if I could order girls, I’d so ask for twins. Holy Crap I’m so so excited about these! I LOVE LOVE LOVE s’mores. I’m heading straight to the store after work! Thanks for sharing this awesome recipe! Thanks Rebecca 🙂 Hope they are a hit. But my oh my do these look DELICIOUS! hahaha… so true and same here for the most part. S’mores are a BIG deal in this house. We’ve even been known to “toast” our marshmallows mid-winter over the gas stove flames! 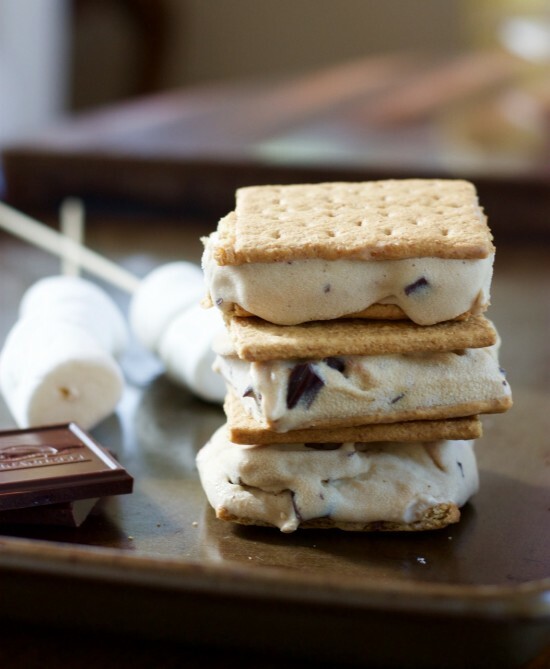 Your idea of turning it into an ice cream sandwich-style treat makes them even better for hot summer days ahead. Can’t wait to share these with my husband when he’s home. Thanks, Kristina — and happy reunion-ing! Love this idea! Genius to put the roasted marshmallows into the ice cream! As a mom of both a boy and a girl, I must say I was happy I had the boy first. Girl is tons of fun and so interesting to see the differences, but also some similarities. You’ll be a fantastic mom! That’s so sweet Ann, we definitely want a few kiddos and hope to have a mix, but secretly I’m super pumped that we are having a boy first to get use to this whole being a mom thing. I just know I was a strong willed little one and I pray that our son is more mild tempered. I don’t know how I’d handle it. That would be “weigh in” vs “way in” – you think I’d proofread my comments before hitting post…. And no– that is a heck of a lot of kiddos. I’d guess at some point you just go crazy with that many. 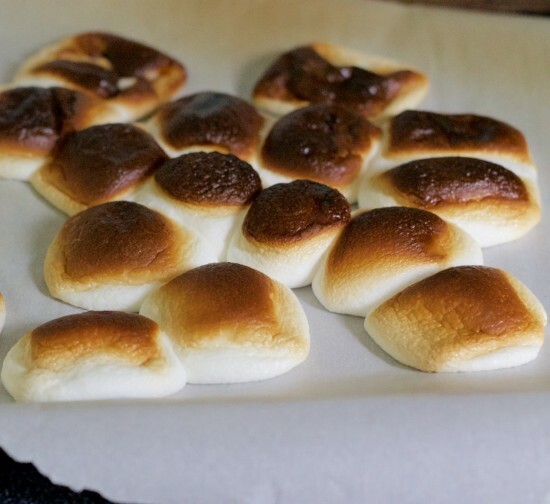 Banana smores sounds soo good!! Thanks Jess!! I’m right there with you. hahaha. that’s a good way to look at it. Oh yes, the girls bring all the drama. With two of them, I fear for the teenage years. 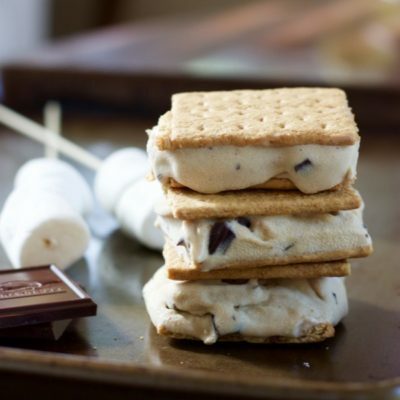 Lovin these s’mores ice cream bars. They look irresistible. oh mama. you got this, you’re such a rock star.